I am sure you all remember my post on Tarte's six piece collection, that I got on QVC a few weeks ago. 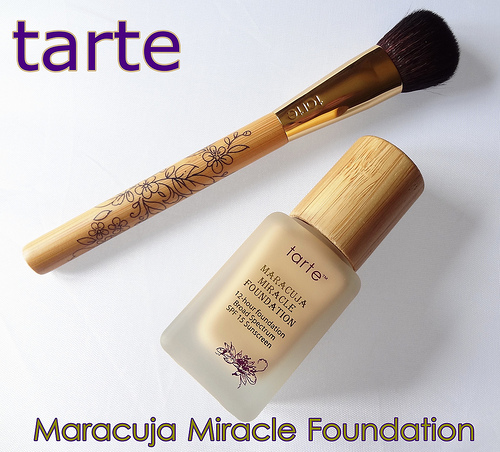 Well, today I am going to share my thoughts on Tarte's Maracuja Miracle 12 Hour Foundation Broad Spectrum SPF 15 Sunscreen ($42.00), and the accompanying bamboo foundation application brush, which were both included in the kit. First, I absolutely love the frosted, recyclable glass bottle packaging. It's heavy, looks luxe, and is super sturdy. Not to mention the sustainable bamboo cap, which just adds to the eco-friendly factor. I can appreciate the inclusion of a pump, but I find the pump a bit hard to control. It always distributes more product than I would like. So, I need to be super careful. I have the foundation in the shade 'light', which is a perfect match for my NC25 skin coloring. It has the perfect amount of yellow in it, that blends well with my skin tone. Tarte's Maracuja Miracle 12 Hour Foundation gives a nice, medium-full coverage that does a nice job at evening out the skin tone, and concealing minor acne and scars. About a pump is all I really need. I enjoy the foundation's smooth consistency, the seamless way it blends onto my skin, and the healthy looking finish it gives off. Apart from the hard to control pump, unfortunately there were some other issues I encountered with this foundation, that sort of put me off a bit-causing me to have mixed feelings about it. For starters, the fragrance. I personally don't enjoy it and I find it to be strong and cloying. I can't exactly pinpoint what the scent is but, I don't like it! Luckily, the smell does dissipate after awhile. The next issue is the longevity of the foundation. This is where it gets interesting. While testing, I realized that this is not a really great foundation pick for the summer, if you have oily skin like I do. During warmer weather, my skin produces more oil than usual and, this foundation just can't keep up with my oily skin. I wore this foundation out on a hot humid day, and within the 2 of the 9 hours of wear I had this on, I was a major oil slick. The foundation had slid around my face and I looked a hot mess! This occurred even though I had set the foundation with a translucent powder. Good thing I had a setting powder with me that day, to touch-up. When the colder weather arrives, my skin is less oilier and much drier so I have no doubt that this foundation will be perfect to use, then. It's moisturizing and it will give me the healthy, dewy glow that my winter dry skin so desperately needs. I am sure it will last much longer on my skin then, too. Apart from being oily, my skin is also sensitive and acne-prone, and I am happy to report that this foundation did not irritate my skin, or break me out. As for the included foundation brush, it's not really my preferred tool for applying this foundation. Don't get me wrong, it looks lovely and it blended the foundation nicely onto my skin but, I find that applying this foundation with either a stippling brush or my beauty blender sponge gives a much more seamless, natural looking result. I found that this brush absorbed a lot of the foundation, which caused me to go back and apply more of the foundation than I actually really needed. Not cool! At first, this brush felt rough on my skin and shed on me like crazy. You can all probably imagine just how annoying it was to pick the loose brush hairs off my face. Luckily after I cleansed the brush for the first time, the hairs have softened up significantly and the shedding has stopped. Even though the brush is fairly soft now, I have to say, I've used softer brushes. I reserve this brush for powdered blush and contour color application. It contains an ideal shape for those purposes and it performs really well. Overall, I am not going to completely rule out this foundation. It didn't quite work out right now for me, on my super oily skin. But I am going to try this foundation again in the fall/winter months when the weather cools down and my skin is on the drier side, as I am sure it will work nicely for me then. 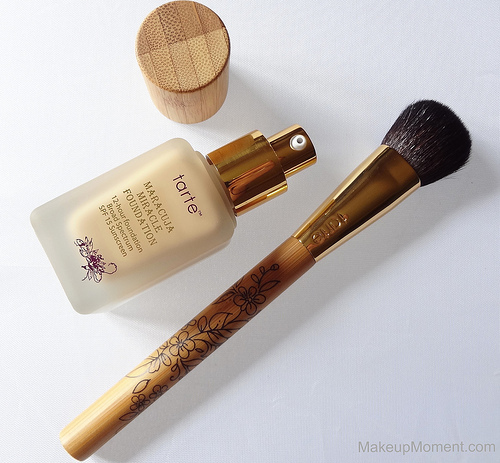 When Tarte says that this foundation is best suited for those who have dry and dehydrated skin, they mean it! Dry skin types will surely appreciate the moisturizing feel as well as the glowing, healthy finish that this product imparts on the skin. 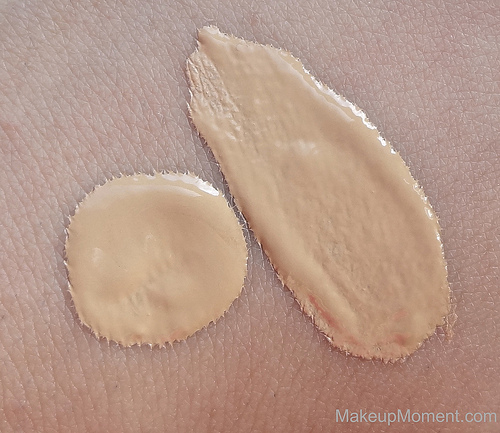 What do you all think of Tarte's Maracuja Miracle 12 Hour Foundation? Which are your favorite foundations for summer? I would like to try this maybe during the fall. Thank you, Jazmin! Yea, I think this foundation will work better during the fall/winter months. I was just reading about this foundation yesterday and had decided that I wanted to try it. What a coincidence! Great review! Have you tried the 12 Hour Amazonian Clay one? I just wrote my review of it, will post next week sometime. Thanks, Kayla :) Can't wait to read your review next week! Thank you so much, Jennifer :) I am glad you enjoyed it!